Our monthly Elliott Wave Financial Forecast has been tracking a steady global shift to greater financial conservatism over the last several months. As we noted in October, the long duration of the transition from a "risk on" to a "risk off" attitude suggests that the next decline will "go deeper and last longer than that of 2007-2009," which was the biggest bear market since the Great Depression. The relationship between the MSCI Emerging Markets Index and the MSCI World Index on the following chart shows a trend away from risk that will gradually widen into a trend out of all equities. 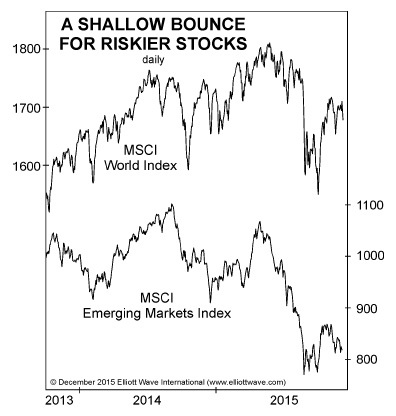 The MSCI Emerging Markets Index comprises riskier stocks, and it made a countertrend rally high in September 2014. The blue-chip World Index comprises shares in more developed countries, and it made its all-time high in May of this year. The current rally shows how much the MSCI Emerging Markets Index is lagging. In fact, it retraced only about a third of its most recent decline while the MSCI World Index retraced two-thirds of the sell-off from its May high. Originally published Nov. 6, 2015. To continue reading insights like this, we recommend you get the 50-page State of the Global Markets Report--2016 Edition 100% free. See details below. This 50-page, chart-filled report may be the most valuable publication you read this year. It will help you avoid the dangerous pitfalls and spot the biggest opportunities in the year ahead. State of the Global Markets Report is one of the most anticipated annual reports for investors like you. We are making the first 10,000 copies available 100% free of charge. After that, it goes to $99 per download, where it will stay for the rest of the year. This article was syndicated by Elliott Wave International and was originally published under the headline A Disturbing Global Shift Toward Financial Conservatism. EWI is the world's largest market forecasting firm. Its staff of full-time analysts led by Chartered Market Technician Robert Prechter provides 24-hour-a-day market analysis to institutional and private investors around the world.